White Sands National Monument has been featured in a variety of western films, including Four Faces West (1949), Hang 'Em High (1967), The Hired Hand (1971), My Name Is Nobody (1973), Bite the Bullett (1975) and Young Guns II (1990). WSNM was placed on the Tentative List of World Heritage Sites on January 22, 2008. The state's two U.S. Senators, Pete Domenici and Jeff Bingaman , wrote letters of support of the application. 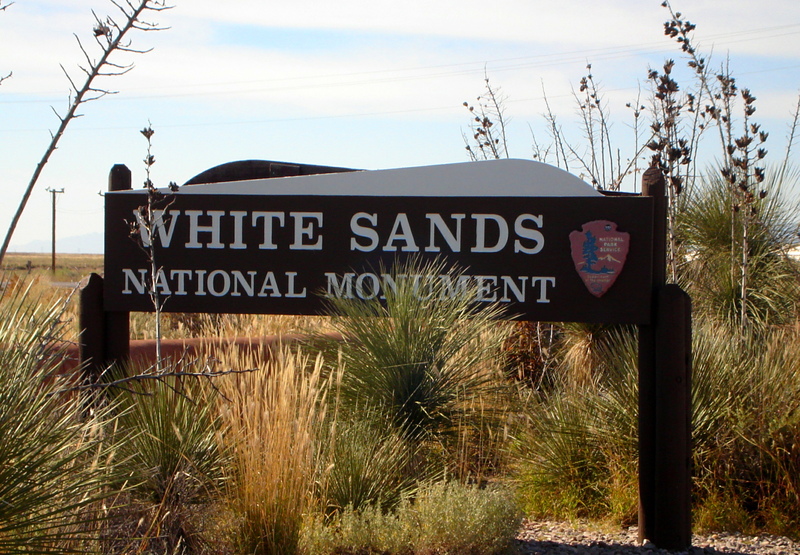 U.S. Representative Stevan Pearce declined to support the application, saying, "I would guarantee that if White Sands Monument receives this designation, that there will at some point be international pressures exerted that could stop military operations as we know them today." The WHS application generated much controversy in Otero County , most of it taking place in meetings of the Otero County Commission. A petition with 1,200 signatures opposing the application was presented to the Commission on August 16, 2007. The Commission on August 23, 2007 passed a resolution of opposition to the application, and on October 18, 2007 passed Ordinance 07-05 that purports to make it illegal for WSNM to become a World Heritage Site. On January 24, 2008, after the Tentative List was announced, the Commission instructed the County Attorney to write a letter to the Secretary of the Interior, demanding that WSNM be taken off the list. Gypsum rarely occurs as sand because it is water-soluble. Normally, rain would dissolve the gypsum and carry it to the sea. The Tularosa Basin has no outlet to the sea, so it traps rain that dissolves gypsum from the surrounding San Andres and Sacramento Mountains . Thus water either sinks into the ground, or forms shallow pools that subsequently dry out and leave gypsum on the surface in a crystalline form called selenite . Groundwater that flows out of the Tularosa Basin flows south into the Hueco Basin. During the last ice age , a lake now called Lake Otero covered much of the basin. When it dried out, it left a large flat area of selenite crystals that is now the Alkali Flat . Another lake, Lake Lucero , at the southwest corner of the park, is a dry lake bed, at one of the lowest points of the basin, which occasionally fills with water. The ground in the Alkali Flat and along Lake Lucero's shore is covered with selenite crystals that reach lengths of up to three feet (1 m). Weathering and erosion eventually break the crystals into sand-size grains that are carried away by the prevailing winds from the southwest, forming white dunes. The dunes constantly change shape and slowly move downwind. Since gypsum is water-soluble , the sand that composes the dunes may dissolve and cement together after rain, forming a layer of sand that is more solid and could affect wind resistance of dunes. This resistance does not prevent dunes from quickly covering the plants in their path. Some species of plants, however, can grow fast enough to avoid being buried by the dunes. 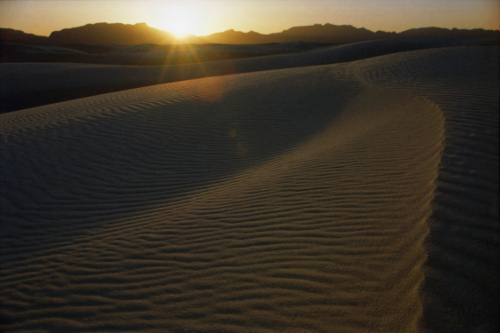 Various forms of dunes are found within the limits of White Sands. Dome dunes are found along the southwest margins of the field, transverse and barchan in the core of the field, and parabolic dunes occur in high numbers along the northern, southern, and northeastern margins. From the visitor center at the entrance of the park, the Dunes Drive leads 8 miles (13 km) into the dunes. Four marked trails allow one to explore the dunes by foot. During the summer, there are also Ranger-guided orientation and nature walks. The park participates in the Junior Ranger Program , with various age-group-specific activities . Unlike dunes made of quartz-based sand crystals, the gypsum does not readily convert the sun's energy into heat and thus can be walked upon safely with bare feet, even in the hottest summer months. In areas accessible by car, children frequently use the dunes for downhill sledding. 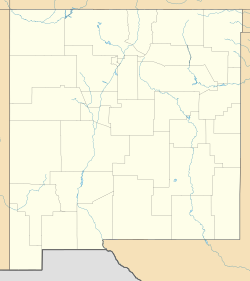 Because the park lies completely within the White Sands Missile Range , both the park and U.S. Route 70 between Las Cruces, New Mexico and Alamogordo are subject to closure for safety reasons when tests are conducted on the missile range. On average, tests occur about twice a week, for a duration of one to two hours. 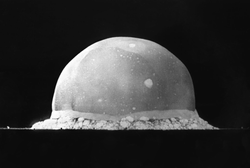 Located on the northernmost boundaries of White Sands Missile Range , the Trinity Site can be found, where the first atom bomb was detonated. Sign at the monument entrance. Map of site ( green boundary) and sand-dune areas, within White Sands Missile Range , on Route 70 . Short video showing highlights of White Sands NM. 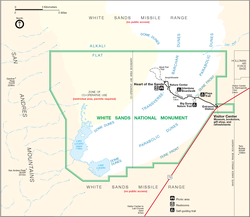 All information for White Sands National Monument's wiki comes from the below links. Any source is valid, including Twitter, Facebook, Instagram, and LinkedIn. Pictures, videos, biodata, and files relating to White Sands National Monument are also acceptable encyclopedic sources. 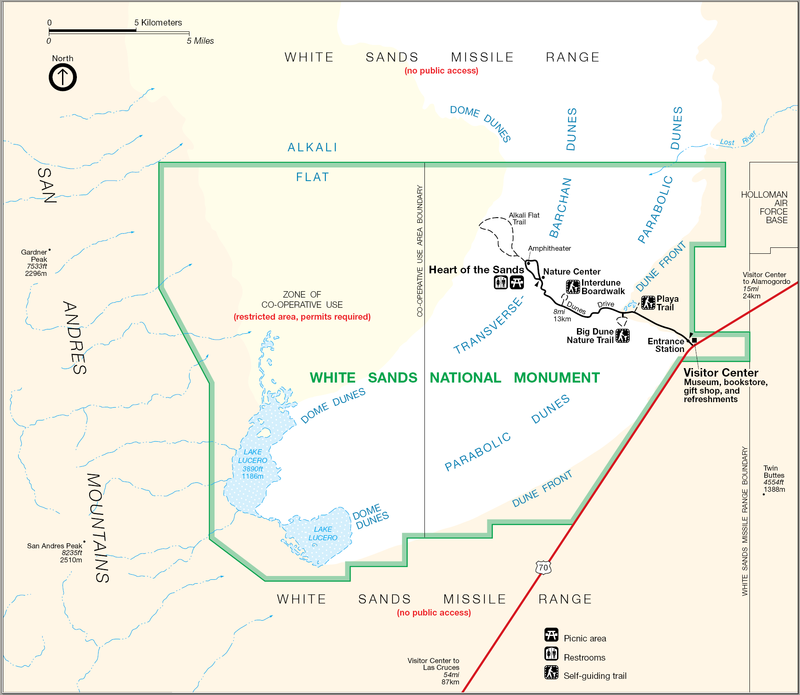 "White Sands National Monument - A Short History"
"The Historic Adobe Visitor Center"
"Secretary Kempthorne Selects New U.S. World Heritage Tentative List"
"Ordinance No. 07-05 Re: World Heritage Site Applications and Designations"
"General Climate Summary Tables - White Sands Natl Mon, New Mexico"
Other wiki pages related to White Sands National Monument.